New construction and any big renovation projects on Long Island would need modern waste treatment systems installed to better filter nitrogen from reaching ground and surface waters. And, starting in 2017, no one would be allowed to repair cesspools in certain “priority areas,” of Nassau or Suffolk Counties. Those people would instead have to install denitrification systems. MELANIE DROZD PHOTO | A striped bass caught recently in Peconic Bay. A New York Senate bill to extend the striped bass season by two weeks went belly-up after it failed to make it through an Assembly committee. The Senate bill, which was approved in May, would have allowed fishermen to harvest striped bass until Dec. 31 of each year, adding another 16 days to the season. Senator Ken LaValle (R-Port Jefferson) sponsored the bill, and initially proposed to have the season extended to Jan. 15 of each year. But the bill did not make it out of the state Assembly’s environmental conservation committee, government officials said. William Young, president of the New York Coalition for Recreational Fishing, a preservation lobby, said the striped bass stock is in decline and that extending the season would threaten the fish. His group sent letters to assemblymen and senators, urging them to let the bill die. A status update of the striped bass stock hasn’t been completed since 2011, said Mike Waine, a coordinator with the Atlantic States Marine Fisheries Commission, which helps to set fishing quotas for commercial operations to protect fish populations. The commission will complete its latest assessment later this year and release the results in the fall, Mr. Waine said. Mr. Young said it would be unwise to change fishing regulations without knowing the latest information on the striped bass stock. But Bonnie Brady, executive director of the Long Island Commercial Fishing Association, said the bill would have helped fishermen meet their quotas, even if stormy weather or other conditions prevented them from getting out to fish. “[Unfilled quotas are] money that’s gone, basically out to sea,” she said. The regulations were put in place to protect the bass when their population plummeted in the 1980s. Now the stock has been rebuilt, Ms. Brady said. “It’d be nice if the regulations would come into the 21st century like the fishermen have,” she said. TIM KELLY PHOTO | Assembly hopeful Jennifer Maertz addresses the Southold Democratic Party during its May 29 convention. Rocky Point attorney Jennifer Maertz will try to accomplish through a primary what she couldn’t do through political conventions, namely gain the Democratic Party’s nomination in this year’s special State Assembly election. The party’s official choice is Manhattan attorney John McManmon, who lives in Brooklyn but uses his parent’s Aquebogue home as his permanent address. Rather than have the county leadership make the choice, the party took the unusual route of leaving the nomination to the three local committees. For the 2nd Assembly District, that’s the organizations in Brookhaven, Riverhead and Southold. Mr. McManmon finished first with Ms. Maertz second. The Republican candidate is New Suffolk attorney Tony Palumbo. The winner will fill what’s left of the unexpired term of former Assemblyman Dan Losquadro, who won a special election earlier this year to become Brookhaven highway superintendent. Ms. Maertz argues that she has far more government experience than the 28-year-old Mr. McManmon. In the political arena, she ran unsuccessfully for a state Senate seat against Republican incumbent Kenneth LaValle in 2010. She replaced Regina Calcaterra of New Suffolk in that race after Ms. Calcaterra was disqualified for failing to meet the residency requirement. Last year Ms. Maertz again ran for the state Senate, but lost a Democratic primary to Southampton Councilwoman Bridget Fleming, who then lost to Mr. LaValle. Mr. McManmon does not concede the experience question. “I’m younger than most people seeking public office, but I am extremely well qualified, have deep roots in the community and an absolutely the right person for the job. He also argues that the residency question is a non-issue. “Once people understand the facts they’ll know that I’m well within the spirit of the law,” he said. The attorney also rejects the idea that he’s waging a throwaway race. COURTESY PHOTO | John McManmon outside his family’s home in Aquebogue. It appears New York City attorney John McManmon has the support he needs to run for the state Assembly seat vacated by Republican Dan Losquadro last year. Suffolk’s Democrats left the decision to the Brookhaven, Riverhead and Southold town committees and on Wednesday morning Mr. McManmon held a mathematically insurmountable lead for the Democratic nod. The Southold committee is scheduled to hold its convention Wednesday evening, the last of the three to do so, but its numbers are not enough to change the outcome. Other Democratic contenders included Cutchogue winery owner Jim Waters of Manorville, Rocky Point attorney Jennifer Maertz, East End Arts director Pat Snyder of Jamesport, Suffolk County Park Police officer Tom Schiliro of Manorville and Riverhead attorney Ron Hariri. 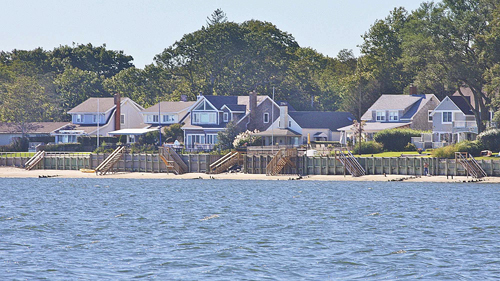 Suffolk’s Democrats gathered on May 20, but rather than select an Assembly candidate the party took the unusual step of putting the choice in the hands of the party committees within the 2nd Assembly District, which extends from north central Brookhaven east to Fishers Island. Riverhead’s Democrats met first, holding their convention last Thursday night, and offering their support for Mr. McManmon. The voting was weighted based on the number of gubernatorial votes cast in each town in the last state elections. The Riverhead committee gave 4,280 votes to Mr. McManmon. He picked up another 1,843.5 at the Brookhaven contention Tuesday night to give him a total of 6,123.5. Ms. Maertz received 2,196.5. Even if Southold gave all of its votes to Ms. Maertz, which appeared unlikely, she would still come in second to Mr. McManmon. None of the other candidates came close. Although its votes won’t affect the outcome, Southold was expected to support Jim Waters, the owner of Waters Crest Winery and a Manorville resident. “I think he’s extremely well qualified and we’re going to do all we can to support him,” said Art Tillman, Southold Democratic Committee leader. Although it appears he’s receive the nomination, there’s been a backlash over Mr. McManmon’s candidacy based on his residency. Mr. McManmon, 28, works for a Manhattan law firm called Millbank, Tweed, Hadley and McCoy, and his address is listed as that of his parents in Aquebogue, although some have said he lives at an apartment on Dean Street in Brooklyn. He said last Thursday that although he lives in Brooklyn during the week for work purposes, he still votes here. Mr. McManmon’s father, James, is an attorney who works for OTB and who has made three unsuccessful runs at a state Assembly seat. His mother, Jeanne O’Rourke, is a deputy commissioner for the Board of Elections.